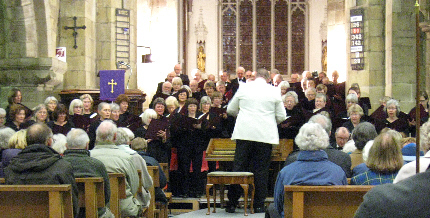 Welcome to the North Yorkshire Chorus website. In it we describe our history and aims, the type of music we sing, our forthcoming concerts, other groups we are connected with, and - most importantly - how potential new members can get in touch with us. Just click on the appropriate button on the left. We offer a very warm welcome to new members. Our principal objectives are to experience and enjoy the pleasure of singing choral music together in our rehearsals, and to reach a high standard of performance that audiences will thoroughly enjoy at our concerts. "The choir was in great voice ... a marvellous performance ... a triumph"
For membership enquiries, see the page. For ticket enquiries, see the page. Contents of this website Copyright © North Yorkshire Chorus, 2008-19. Last updated 14 April 2019.